Archives – The Church Archives are located on the 4th floor of the Education Building. Many volunteer hours have gone into organizing archival records of the life of First Presby. These include session minutes, past newsletters, photographs and many more interesting items. You are welcome to visit the Archives. Please call the church office for available times. The church is currently working on compiling many of its historical documents online. Additional documents, including baptismal records, bulletins, pictures, marriage registries, etc. can be found in The Heritage Room: First Presbyterian Church Archives on the fourth floor of the church. Library – The Church Library is located in the Activities Building on the upper floor near the elevator. The congregation is most welcome to borrow books and resources. The Library contains many Biblical reference books, books exploring each of the Old and New Testament chapters, children’s Bibles, fiction books for children, videos, DVDs and more. First Presby’s library is open from 8:00 a.m.-4:00 p.m. Monday-Friday. For more information, please call 304-343-8961. 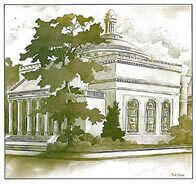 History – Built in 1915, the First Presbyterian Church of Charleston was designed by architects Weber, Werner and Adkins. The exterior is a near replica of Stanford White’s masterpiece, Madison Square Presbyterian Church in New York City, which has been torn down. The Byzantine interior was inspired by the central dome area of St. Marco’s Cathedral in Venice, Italy. The seating capacity of 850 allows newcomers and members to join in worship. A Brief History… was written by Ruth P. Coghill. The Church of 150 Years was written by Ruth Putney Coghill in 1969, upon the celebration of the 150th anniversary of the church. Ruth Putney Coghill wrote the original history of the church, covering the period from 1819-1969. Dolly Sherwood wrote a follow-up to Coghill’s historical narritive bringing the story to 1989 with The First Presbyterian Church, A History: 1819-1989.